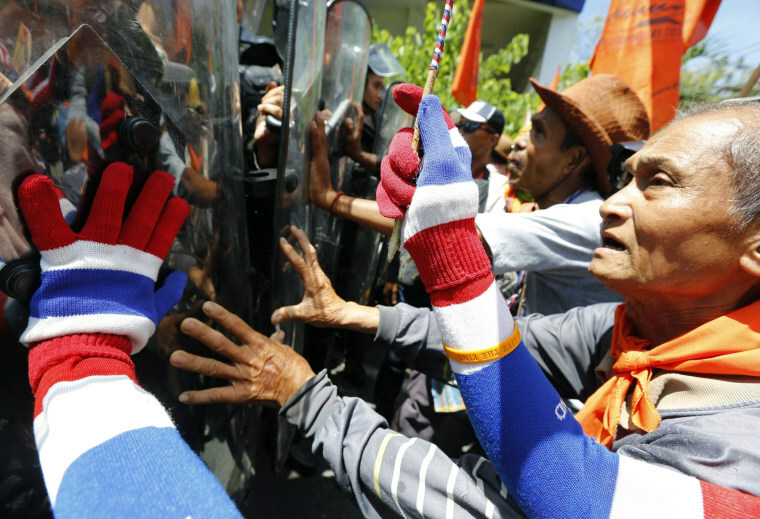 BANGKOK - Protesters seeking to oust Thailand's government broke into the grounds of an air force compound on Thursday where the acting prime minister was meeting the Election Commission to fix a date for new polls, forcing him to flee. The disruption of acting Prime Minister Niwatthamrong Boonsongphaisan's efforts to organize an election came hours after gunmen attacked anti-government protesters, killing three. The turmoil comes as the government loyal to ousted former premier Thaksin Shinawatra squares off with opponents backed by the royalist establishment over who should be prime minister, in the latest phase of nearly a decade of rivalry. Hundreds of protesters converged outside an air force school in north Bangkok after word spread that Niwatthamrong was meeting commission officials there. "We are here to tell Niwatthamrong that there is no point standing in our way," Chumpol Jumsai, a leader of the anti-government protesters, told the crowd from on top of a truck shortly before hundreds of protesters evaded police and streamed through a side entrance of the compound. Commission member Somchai Srisutthiyakorn said the meeting was being abandoned and Niwatthamrong was leaving. "We will have to meet another day," he said. Earlier, a small group of men armed with guns and grenades attacked anti-government protesters near the Democracy Monument in Bangkok's old quarter killing two people on the spot, with a third dying later of his wounds. More than 20 people were injured, police said. Paradorn Pattanathabutr, a security adviser to the prime minister, said he suspected the attack was a reaction to pressure by the anti-government side to force the Senate to appoint a new prime minister. It was the most serious incident since five people were killed and dozens wounded in clashes on February 18, when police made their most determined effort to clear demonstrators.